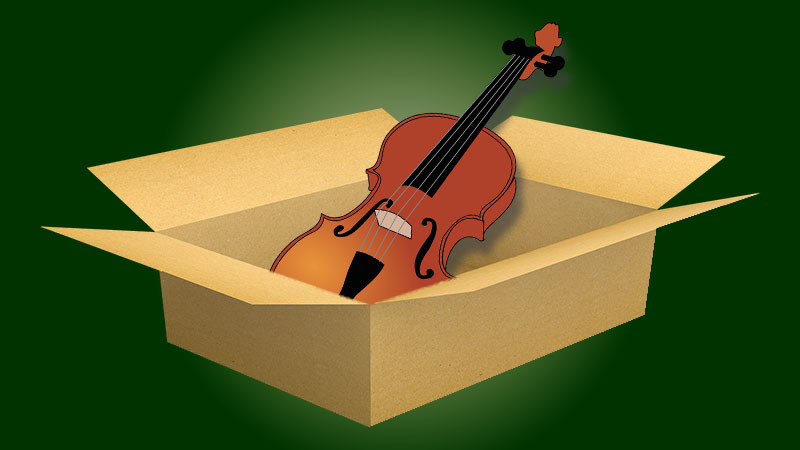 V.com weekend vote: Have you ever bought a violin without being able to try it first? December 23, 2016, 5:04 PM · Ideally, one chooses a violin based on how it feels, sounds and looks, and that means you have to hold it, play it, listen to it and examine it in person. But this is not always possible. If you live in a remote region, or simply in a place that is far from a music shop, you may not have the option to go to a quality violin store and test violins before buying one. That can mean buying something online that you have not been able to play first. I'll probably buck conventional wisdom here by saying that sometimes this can work. In the past, purchasing something from afar involved a lot of risk. As the Internet has matured, so has the amount of information that a consumer can consult for an online or catalog purchase. When it comes to the violin, there are certain "brands" of instruments that have good quality testing and consistency, and based on a recommendation from someone in the know, you can get a good instrument. It has grown far easier to consult experts, read reviews and do research before purchasing something from a far away place, and that takes away some of the risk, though not all. As I said before, on most occasions I'd recommend insisting upon testing the instrument in person before buying it. Two instruments that are the exact same price and "brand" can vary dramatically in their quality of sound. If you use a local shop, many will allow you to bring home several instruments to test and/or show to your teacher before you commit to purchasing one. And some vendors like Shar will even mail out instruments for testing, before you have make the purchase. What has your experience been, with buying instruments tested or untested? December 24, 2016 at 02:00 AM · It's a bit like an arranged marriage, isn't it, sometimes works? December 24, 2016 at 03:54 AM · Never purchased without a trial period first. Last time was summer 2005, when I tried out a number of old fiddles through a distant dealer. Started the process online and had the instruments shipped to my home. There were two 2-week tryout periods as I recall. I ended up selecting two from those I played. It was a long, slow process but well worth the effort. Now, 11 years later, I still play both of these instruments each day -- plus the third 4/4-size instrument I acquired as a student. Very happy with all three -- no plans to lay any aside or trade any of them in. December 24, 2016 at 04:36 AM · I bought violins online in the beginning. At first, things worked out, but after one unsuccesful attempt, I started to try before I buy. December 24, 2016 at 07:01 AM · There is an issue about buying an instrument unplayed that Laurie didn't mention--although it may not be an issue for a first student instrument: it's always a good idea to play instruments above and below your chosen price range, and it would be tedious in the extreme to do that via remote trials. @Jim, how did you deal with that wrinkle? December 24, 2016 at 08:28 AM · My dad tested it for me as I wasn't there and he knows his stuff. December 24, 2016 at 08:29 AM · I once bought a violin from my violin teacher. I never liked the sound of it, but was too polite to mention it, as I felt my inexperience was the problem. Many years later, when it needed a repair, the luther told me just how bad it was. Basically I had been sold one that my teacher clearly wanted to get rid of. I bought another (on line since I live on as island without a decent music shop) and have never looked back. The message from my experience is clear, you cannot always trust your violin teacher, so always get a second opinion! December 24, 2016 at 11:58 AM · I'm not a concert violinist. I am a very busy fiddle-playing entertainer doing 2-3 gigs a week for a long time. In the past 35 years I've bought 6 violins over the telephone or internet without hearing or trying them. But, I carefully gathered all the info I could before I bought any of them. Five were as good or better as advertised and suited my purpose well. The only 'dud' was a special order violin which now just hangs on my wall as a red maple VSO ornament! December 24, 2016 at 02:12 PM · With no violin shops near me, I have to buy online. I have bought three violins from China : one was mediocre but still worth the money. The other two instruments were great. I sent the violins away to a capital city to be set up and the luthier did comment on how good they sounded. December 24, 2016 at 02:23 PM · @Francesca: Very good advice. I followed this plan in the second trial period -- i.e., going above my price range. I liked the sound, but the one in my price range finally won out. A tough call -- I took about 2 weeks to compare and finally decide. But now, after 11 years, no regrets. Bottom line: Whatever the purchase method, local or online, give any instrument plenty of tryout playing time before handing over the full amount due for purchase. "Try before you buy." December 24, 2016 at 07:05 PM · But what are the purchase options when you don't play the violin? I knew I wanted to play the violin but had literally never even held one in my hand when I decided to make the plunge. I knew no one personally who played one so that was not an option. Beside I was involved in a bluegrass group but knew that classical violin was where my playing would take me. Hearing someone play scratchy bluegrass on a trial violin was not going to give me the right sound anyway. Instead I did some web research and based on some admitted unsubstantiated positive ratings got in touch with a violin distributor. After about two hours on the phone the person on the phone understood my purchase criteria (violin set up, not a fiddle set up and it needed to be good enough to get me through at least 3-4 years of classical lessons before it became a hinderance to progress). I purchased on a trial basis from a store located out in Washington state and have been very happy since. I'm now taking lessons now from a graduate of a very prestigious conservatory and he says my violin is fine. Perhaps I was just lucky. I never considered the eBay route because of all the bad reviews. December 25, 2016 at 02:12 PM · i bought a Hofner violin(copy of 1741 Guarneri) from Thomann for about 3000€ and i'm not by any means disappointed. December 26, 2016 at 05:40 AM · I bought one violin without trying it; a friend of a friend was selling an old violin she inherited that wasn't set up and needed some work to be playable. It was around 100 years old and judging by the wear had obviously been played a lot over its lifetime. I was looking for a "camp fiddle"; i.e., one with reasonable tone that I could take to fiddle camps and outdoor gigs without worrying much about it, so I took a chance on it. Turned out to be a decent fiddle, probably not worth much more than what it cost to purchase and restore it but a good player and I had the satisfaction of giving an old instrument a new life. December 26, 2016 at 01:35 PM · At a certain point it can be better if you don't get to try it before you buy. An instrument by a good maker might not be enough like the instrument that's holding you back for you to like it. It can be better to just get the instrument and adjust to it and let it teach you a thing or two. December 26, 2016 at 04:57 PM · You know, that is a good point! A step-up instrument may not be to your liking because it is not going to feel familiar. Add to that the fact that a better instrument will magnify not only the good, but also the bad. So you may feel at first like you sound worse, but actually, the good instrument will allow you to better hear those things that need work. It will direct your practice in perhaps a new way, but the better result may take time. December 29, 2016 at 12:06 PM · @J.R. :- "It's a bit like an arranged marriage, isn't it, sometimes works?" Speed dating sounds so much like speed hating .. beware. December 29, 2016 at 05:27 PM · Shopping online doesn't mean you buying something sight unseen -- reasonable trial period (one month for me) and return policy are vital part of good online shopping. I recently just bought a bench-made violin (Topa) online. It was my first time shopping violin online, and it also is the most expensive one I've ever bought and the finest one I've owned. In fact I tried this one a lot more carefully than I did with the ones I previously bought in local shops. Not only I tried it myself for a few weeks, I also asked a few others, including my teacher and her professional colleagues to try in different places (concert hall, studio, etc.). I also brought it to a local luthier to get the fingerboard planed at the seller's cost before I finalizing the purchase. It has worked for me very well. I live in a small city, Victoria, British Columbia. The local supplies are limited. Also, I'm not good at dealing with actual and perceived pressure of sellers whom I personally know. Shopping online allows me to be more relaxed and objective because my relationship with seller is not so personal. I'm very happy with my experience of this purchase.